The Charlemagne one seems pretty good for an Early Medieval/Dark Ages campaign (with neat takes on three otherwise kinda nice but bread and butter Fighter's Handbook kits - Noble W., Peasant W. and Wilderness W.) but I've never owned it; I can't tell that much about it other than it seems pretty Nice. I know Even less of the Greek Book but it has options for both Mythic (Bronze Age) and Classical era play and has a Mythic Hero kit, as far as I can remember. It's is semi-mythical and covers everything from historical to low magic. I don't know how much of this feeling is because of coming back to this book after a couple decades focused more on 3.0/4.0 and other RPGs, but in general the amount of 'crunch' in this book seemed a bit low. On the other hand, I think that the various historical GURPs books are something that should exist, even though I don't personally like GURPs. Remember that in the era this book was written, the Internet was much less of a thing. Today, if you want to do a historical campaign, you have Wikipedia to give you searchable "good enough for a game" material from the comfort of your home. In the early nineties, researching would have meant trips to the library, so having a short game-focused overview of the "setting fluff" was a lot more valuable. Yes, I've run into a similar thing when reading older issues of Dragon. There, it was all the reviews of upcoming and recently released products. Now, that feels weird because the Internet is such a massive advertising tool, but back then, that was how gamers got a lot of the news on what was being released. This book is a ‘Campaign Sourcebook’ as per the title page and has 95 pages of content plus a map and an ad. I’m reading this as a PDF, so I’m not sure how the map would have been included. The ad is for the ‘The Ivory Triangle’ boxed set for Dark Sun. If it's anything like the Greeks book (which I have), the map is a fold-out section attached to the inside-back-cover. Kudos on the thread, however. It's a good map, I think, and this comes from someone who has been playing far too much Crusader Kings II of late: The main map shows the Roman Empire at it's height with insets showing the growth over the centuries. The main map is primarily a political map, with major rivers added, and does show the Roman road network built. To keep the scale of the Roman empire in mind (which is probably why it has an enduring role in European-inspired culture) the Empire circa AD 117 spread through what is now England north to Hadrian's Wall, all through France and Spain; everything west of the Rhine; Egypt, Mesopotamia, and regions along the south of the Black Sea; and Northern Africa. Another inset shows Italy in detail, including Sicily, with cities shown. Another inset shows a very rough map of Republican Rome (the city) in very rough detail. Essentially little more than a map of the major neighborhoods, with no real street-level information. Then again, this may have been another instance of trying to only show the 'historical' viewpoint, so only key places with strong evidence to narrow down locations are shown. Yes, I've run into a similar thing when reading older issues of Dragon. There, it was all the reviews of upcoming and recently released products. And (sparse!) event listings for GenCon, complete with "raffle"-style mail order sign-ups. An art note: The artwork of a statue (I hope) of a wolf suckling two human babies on page 3 is slightly disturbing, if only because the wolf is depicted in a strangely stylized style and the babies look a bit demonic. That would be the Lupa Capitolina. 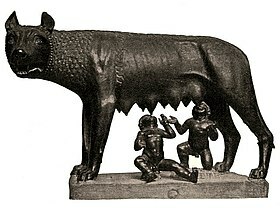 The weirdness comes from the fact that the wolf is an Etruscan work (or at least a copy of one), while the twins were added in the Renaissance. The article B. Cephalus linked to is interesting, as it mentions there's some controversy over the history of the statue and it may be far removed from the Roman Empire. I did not know that this statue was a major symbol of Italy as a 'nation' and many copies were sent out to various cities pre-WWII as a show of goodwill. Additionally, it's been used by Romania, Moldavia, and other countries as a symbol of their Roman heritage. Something about the drawn version still makes the babies look a little demonic, to me. Something about the proportions or similar. Since I didn't discuss art in HR5 much earlier, I'll catch up with a brief review. In general, this book has a functional, scholarly appearance with small drawings used to help differentiate chapters in the header of each page. At least for chapters 1 and 2, art is sparse, and is pretty restrained by early-90s D&D standards. Chapter 2 loses a lot of space to a timeline that runs across nearly half the page-height for five pages, providing a reference for major events from 753 BC ("Founding of Rome") to AD 476 ("German chieftain Odoacer deposes Romulus Augustus, western empire ceases to exist"). As I've mentioned, this book does do an admirable job to try and survey over a thousand years of history in a dozen pages. This piece shares a page with "The Five Good Emperors: A.D. 96-180" and discusses a long period of sanity for Rome with rulers that were considered good military leaders and statesmen, and generally expanded Rome. It stands out to me because it's not just a 'snapshot' of a scene, but a more composed image. The statue in the lower right is the Augustus of Prima Porta. The top two images look familiar, but I can't place the busts at the moment.